Ivan Conti (aka Mamao) is one of the greatest drummers on earth. 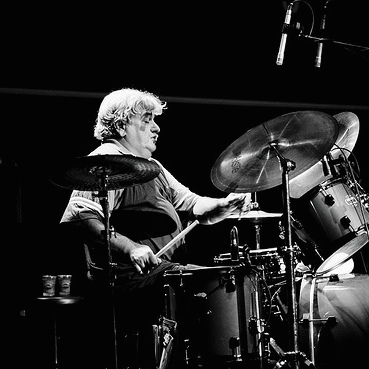 A true rhythmic innovator, he is Brazil’s answer to Tony Allen, Steve Gadd, and Bernard Purdie. Known by most as one third of Brazilian jazz-funk pioneers Azymuth, his career spans far beyond with over half a century’s worth for recordings with the likes of Milton Nascimento, Eumir Deodato, Marcos Valle, Roberto Carlos, Gal Costa and Jorge Ben. More recently Mamao recorded an album with hip-hop legend Madlib under the shared moniker ‘Jackson Conti’ and has performed on countless Far Out Recordings projects, alongside the nine Azymuth albums the label has released. Mamao is also soon to release a new solo album under his own name. Back in 2005, Mamao underwent replacement surgery for his right hip at the INTO Hospital Traumatology Institute in Rio de Janeiro. The surgeon successfully installed a titanium prosthesis and he became ‘the iron kick’ (but never lost his signature Samba swing). After slipping over on a wet dressing room floor while on tour, Mamao is now in need of a replacement of his left hip (his high-hat side this time). He was due to go into surgery last month (April/2017) but the hospital he was due to have the operation at is currently undergoing federal intervention, due to the extreme corruption epidemic Brazil is currently facing. Mamao has been stuck at number 43 in the queue for his surgery for months, and has been told there is no predicting how long he will have to wait. He has advanced osteoarthritis in his leg, his left hip is totally deteriorated and he is living in unimaginable pain. Due to the urgency of the matter, we’ve decided to start an emergency fund to have the procedure done semi-privately. The surgeon who operated on Mamao’s right hip 12 years ago has offered to help and has quoted Mamao a discounted price of just over 60,000 Brazilian Reals (£16,000) for the procedure. This includes anaesthetists, 3 days in the hospital, all medical staff and the prosthesis, as well as physiotherapies in the hospital and then for a following 10 days at home. Unfortunately, due to Mamao’s condition, we have had to cancel Azymuth’s forthcoming European tour dates in July. However, we are currently re-scheduling all European dates for October 2017. Some of Mamao’s musical friends and family are also planning a special series of live events in Brazil to help with the funding campaign. All contributions to Mamao’s medical fund that have been sent direct to Mamao will be included in this Go Fund Me campaign total. Each and every donation will get Mamao one step closer to receiving the treatment he urgently needs. We understand that not everyone is in the position to donate, but at the very least sharing this message will help spread the word and indeed help out this drumming master who has a whole lotta music left in him! Thanks for taking the time to read Mamao’s story. Your help is hugely appreciated!